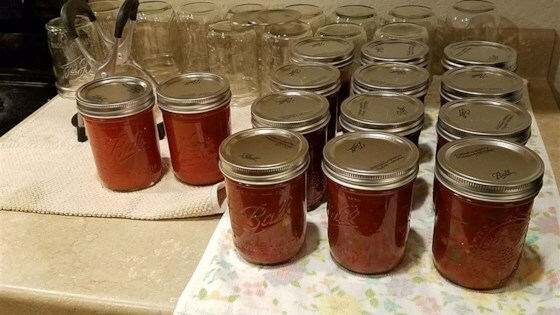 "As a recipe made for using your garden-fresh vegetables, this canning recipe makes a fabulous salsa. Use this salsa in place of RO*TEL® for a cheese dip or added to mashed avocados with lime juice for guacamole or eat it on rice. And of course, it's used as a dip for tortilla chips or topping on other Mexican dishes." Combine tomatoes, onions, tomato paste, green bell peppers, red bell peppers, vinegar, banana peppers, sugar, garlic, pickling salt, and ground black pepper together in a large pot; bring to a boil. Reduce heat to low and simmer until slightly reduced in volume, about 1 1/2 hours. Sterilize the jars and lids in boiling water for at least 5 minutes. Pack salsa into hot, sterilized jars, filling to within 1/4 inch of the top. Run a knife or thin spatula around the insides of the jars after they have been filled to remove any air bubbles. Wipe the rims of the jars with a moist paper towel to remove any food residue. Top with lids and screw on rings. Place a rack in the bottom of a large stockpot and fill halfway with water. Bring to a boil and lower jars into the boiling water using a holder. Leave a 2-inch space between the jars. Pour in more boiling water if necessary to bring the water level to at least 1 inch above the tops of the jars. Bring the water to a rolling boil, cover the pot, and process for 35 minutes. Substitute 1 cup chopped jalapeno peppers for the banana peppers if desired. Add 1/2 bunch cilantro at the end of cooking if desired. Process jars for 45 minutes if using quart-size jars. Cooked it down so it was nice and thick. Added a bit more sugar and cilantro. First batch of tomatoes from the garden this year done!